For me, finding the right concealer is akin to reaching my goal weight. Whilst there are products (and diets) that get me nearer to my aim, no concealer (or regime) has given me the results I really want. 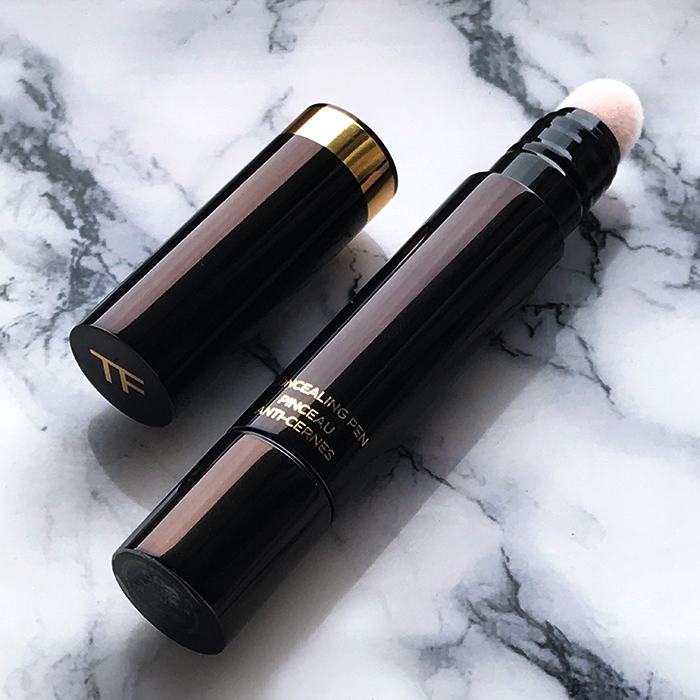 Since my mother didn’t raise a quitter, I decided to go at it one more time with Tom Ford’s Concealing Pen in ‘5.0 Bare Beige’. Here is my review. As the name suggests, this concealer comes in a pen format with a twistable base to release the product. The metallic brown tube and gold lettering give off a luxurious vibe that goes well with the price point. On one end, the tube is fitted with a soft, cushion applicator that is gentle on skin and helps buff in the formula. A major downside though is that the sponge tip absorbs quite a bit of product. The shade number is mentioned on a sticker beneath the tube. On the formula front, this one was surprisingly superior to other liquid concealers. Instead of being runny and slippery, the consistency was more of a hybrid between a cream and a liquid. This allowed me to build up and blend the colour easily. The formula is really lightweight and goes on smoothly, without any patchiness or tugging. Although the sponge does a good job at blending, I usually follow it up with my ring finger to ensure that the product is undetectable. One important to thing to note is that this is not a full-coverage concealer. Whilst you can build it up to medium coverage, the pigmentation is intended to be quite sheer so as to provide a natural finish. ‘5.0 Bare Beige’ is a neutral-toned beige that is suitable for fair-to-medium complexions. I require 2 coats to cover up my dark circles and a single coat to even out my skin tone. I’ve been using this concealer exclusively over the past few months and have been quite happy with the results. The formula shows minimal creasing and fading over 6 hours, without changing colour, caking or emphasising the texture of my skin. I love how it makes my skin look brighter and well rested. Since my under eye circles aren’t too dark, it manages to camouflage the area entirely. However, if you have deeper circles or inflamed zits, this concealer is not the one for you. The formula is neither drying nor hydrating, but if you do have very oily skin, I recommend setting the product with a powder. Weightless, long lasting and fluid, this luxury concealer actually meets my requirements and matches perfectly with my skin. Now, all I need to do is find a fitness regime that works as well as this product!